The buying of indulgences was a medieval practice whereby in order to expiate your sins and thereby minimise the time spent in Purgatory, you could engage in a monetary exchange with members of the clergy known as “pardoners”. You could buy the effects of their good deeds to basically neutralise, or offset in modern parlance, your sinful deeds. This lucrative trade in indulgences generated useful income for the Catholic Church, which at the time was suffering from a shortage of funds. It was a crafty and time-saving way of dealing with one’s sins which otherwise could only be expiated by doing acts of penitence, or undertaking pilgrimages to the Holy Land and other difficult and time-consuming activities. The Carbon Neutral Myth maintains that just as the buying of indulgences was a mercantile practice, modern day carbon trading is equally mercantile and just about as effective. It is all just about “buying hot air”. 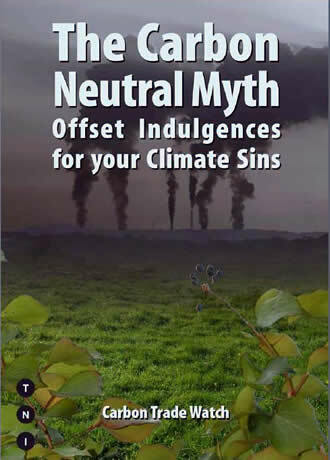 In just 80 clearly written pages, Kevin Smith refutes the claims made by carbon trading companies that individuals and companies can easily offset their emissions by paying for trees to be planted (the main method of offsetting) which then supposedly soak up any emissions created, allowing people and corporations to continue polluting with clear consciences. Carbon trading companies, just like the medieval church, gain enormously at the expense not only of people who may genuinely believe that what they are doing is effective, but also at the expense of people in the global south whose lands and livelihoods are frequently adversely affected by the planting of trees on land formerly used for farming. It is very often a case of “we pollute, they pay” with the only benefits going to corporations like Climate Care, the Carbon Neutral Company, Future Forests and many others. Even a report by Standard Life Investments warns that such schemes “have the capacity to disguise the failure to achieve actual reductions in overall greenhouse emissions”. Such schemes generate complacency in people which creates a “business as usual” mentality when, to quote Smith, “offset companies are selling ‘peace of mind’ to consumers where none should exist as regards climate change”. This is a hard-hitting report which, while shying away from actually advocating any kind of specifically anti-capitalist policy, nonetheless sees the remedy not in trading away environmental “bad deeds” on the part of individuals and businesses, but in political organisation and political activity. The author calls for wide “systemic changes that need to be made in our societies and economies” for instance but praises businesses such as a removals and storage company Alexanders, based in London which invests in renewable energy projects around the world and which promotes resource efficiency in its day-to-day work, using recycled packaging materials and scrap paper. The company had looked at carbon trading schemes but rejected them as not being an efficient or ethical way of dealing with their environmental impact. The booklet examines in great detail the various schemes and “shell games” in use today to help polluting companies and governments, as well as the general public, to continue with their unsustainable activities and to neglect to take serious action on climate change. This is the main strength of the report. The conclusion, on the other hand, sees political activity as being more and stricter regulation with penalties imposed on polluters at “community, local, national and international levels”. Organisations and governments should also commit themselves to supporting communities which have been adversely affected by climate change and “so called climate friendly projects” such as the various carbon-trading schemes. This is all very laudable, of course, but the business-as-usual governments and companies are hardly going to take this sort of advice. This is especially so since overall economic growth, which necessitates business-friendly policies, is the goal of all states, whether in the industrialised, developing or 'under-developed' regions of the world. This is because there is no way in which the state of carbon “neutrality” can be achieved and there are also issues of social justice involved. The study examines this by outlining three case studies, a plantation in Uganda and in India and an energy efficient project in South Africa. The South African case involved the distribution of low energy light bulbs in a poor township in Capetown, a neighbourhood where the inhabitants barely had enough income to sustain themselves, not to mind enough left over to be able to engage in environmentally-destructive activities. To add insult to injury the offsets from their newly installed light bulbs were used as offsets by corporations such as British Airways and British Gas, making the impoverished inhabitants of the township, Guguletu, unwitting accomplices in the “activities of the carbon world”, as the author puts it. The cases of the plantations in Uganda and India were even worse resulting, in the Elgon region of Uganda, in the violent eviction of people from lands slated for planting, land which had been farmed and used for cattle-grazing for many generations and where even the collecting of firewood from the forest became a criminal activity. Meanwhile, in Karnataka province of India, villagers became the recipients of 10,000 mango saplings which they were then expected to plant, water and harvest in order to provide fruit for trade and local consumption. The chief benefactors of this initiative were the rock group Coldplay in partnership with the Carbon Neutral Company (CNC), who intended to offset the environmental impact of the manufacture and distribution of their new album in 2002 as well as other aspects of their rock lifestyle. Fans of the group were even encouraged to pay to have a tree in the mango plantations dedicated in their names. Needless to say, this turned out to be just more high profile greenwash. Many of the mango trees failed due to lack of sufficient water and fertilizer. The villagers were promised fertiliser, money for maintenance of the trees and the use of water tankers, but few growers actually received either the money or the resources. Other vital agricultural activities suffered, which in such a marginal community could have been disastrous. Coldplay were and are not the only celebrities treading the emissions neutralising route via carbon trading. The Rolling Stones, U2, Brad Pitt, Angelina Jolie and others have also engaged in well-publicised stunts of this kind. Perhaps, to be kind, they really believed that what they were doing was genuinely having a positive effect. The 2005 Live 8 series of concerts run in parallel with the G8 Make Poverty History campaign - deemed a “fiasco” by the author, is used as an example of how celebrity endorsement sabotages and distracts from serious activity. The July 2007 Live Earth’ concerts were too recent for the report to have been able to make a useful comparison with Live 8, but it is unlikely that the efforts of Al Gore, Madonna, et al. bore any more fruit in alleviating poverty. The Carbon Neutral Myth is an extremely useful resource which tells you all you need to know to refute suggestions that carbon trading, or emissions offsetting, is a good way to proceed where efforts to live a sustainable life are concerned. The truth is that carbon trading does not work, for as the report states there is simply not enough land to plant trees in sufficient numbers to even begin to have an effect, while at the same time carbon storage in trees and plants is time limited, so as trees naturally decay or are cut down, carbon is once again released! Ultimately, there can be no market-led “solutions” to climate change since, as the Stern report revealed, global warming represents the biggest market failure ever! In fact, nothing less than an overturn of capitalist economic relations and a transfer to not-for-profit production can create a platform for meeting the eco-crisis facing humanity.